Raja Ampat Regency is known as a small archipelago and it is part of West Papua Province. Due to the existence of many islands in such region, travelers have numerous options of a vacation destination. As for reference, there is Gam Island with its majestic beauty. 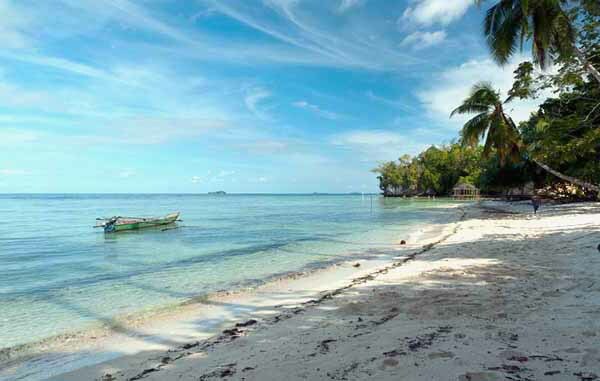 The island is famous for its white sand and lush trees. As if, it was created by the God directing using His hand. What makes it different than other islands, actually? The answer is the cottages, which are located near to the beach. Visitors can relax and enjoy sea scenery at the same time! The prime attraction in Gam Island is its coastal scenery. It offers calm waves and beautiful sea color. Not to mention the water is quite shallow, on which tourists can swim and explore. As mentioned before, the island features some small cottages. There are even piers, which are located near to them. No wonder, boats often pass and drop by there. When it comes to the land, Gam has a hilly landscape with lush bushes. It is possible to climb, but it may require much effort. Most of the visitors come to Gam Island to enjoy snorkeling, as the underwater scenery is mesmerizing. They want to see the famous Manta Rays, which are often seen near to Arborek. It is said the width of such creatures reaches up to 4 meters! Not to mention it weighs a lot. Only professional divers have the courage to get near to them. It is because the size is gigantic, so any careless moves may lead to injuries. For a precaution, beginners should reach those creatures along with an instructor. It is a must! The next activity is visiting the local settlement. People living in Gam Island are considered friendly and approachable. They often offer some local foods to visitors freely, as well. Some of the best foods are Manokwari Grilled Fish, Ulat Sagu Skewer, and Ikan Bungkus. All of them are worth a try, so everyone should never miss them. The villagers may also introduce their local traditions to tourists. These become a unique attraction for everyone! Therefore, it is better to carry a camera and capture such beautiful entertainment. In a nutshell, Gam Island offers numerous fun activities to visitors. These include bird watching, snorkeling, and diving. In the south, there is even a formation of mangroves! When it comes to accommodations, tourists can take advantage of numerous options, including local cottages and resorts. What they need is some money, as they are likely to spend on transportation, foods, and a place for sleeping. In order to reach Gam Island, travelers should pass some checkpoints. The first destination is Waisai City, which is the capital of Raja Ampat Regency. From Jakarta, tourists need to take an airplane to Marinda Airport. Next, they should reach Waisai Port and take a speedboat to Arborek Island. From there, they may continue the trip to Gam. That’s all.